It is human to fear an illness and when it is diabetes, the fear starts with wondering what you can or cannot eat! Especially since there are so many myths about what should and should not be eaten. 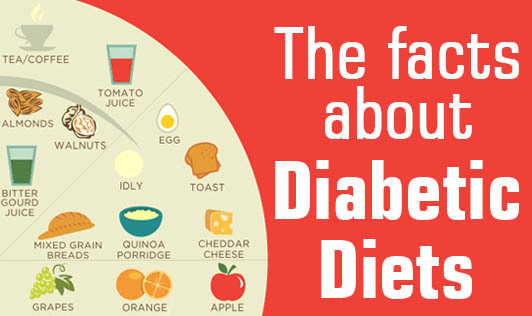 Here are a few myths about diet and diabetes and other facts related to it. Diabetes occurs due to a combination of genetic and lifestyle factors. However, if one has diabetes, eating sugar will lead to high blood sugar. For a diabetic, sugar/jaggery/honey are all the same, and can cause equal harm. High fiber, moderate carbohydrate, low intake of refined foods and fat is the recommended diet for a diabetic. This diet can also be prescribed to anybody for maintaining good health. There is no such thing as a boring diabetic diet. However, it just needs to be individualized based on an individual’s usual intake and their medications. Rice is a high GI food and causes blood sugar to rise fast. It should be combined with high fiber foods like salads or whole grain chapatis and pulses. The amount consumed should be as advised. Fruits are a source of antioxidants and are necessary for good nutrition! A diabetic can have high fiber fruits like apple, pear, orange, and guava. Banana, Sapota (chickoo), custard apple (sitaphal), grapes, mango, and jackfruit should be avoided as they contain lots of sugar. A food may be labeled as "sugarfree", but that does not mean it is fat free. Moderation is the key, as fat is also a restricted nutrient to prevent development of complications in diabetics.